Custom Robot Parts for Vex IQ by sgeiger is licensed under the Creative Commons - Attribution license. 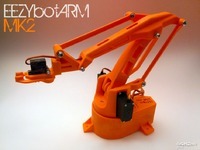 Students will apply 3D modeling skills to create a custom, 3D-printed robot part. Alternatively, students can be introduced to basic 3D modeling skills through this project. Specifically, the activity identifies resources and a process that can be used to extend the Vex IQ Robotics system with customized 3D printed parts. 3D printing opens up many possibilities for customizing the Vex IQ robotics kit. Essential Question: How can you extend a robot design with custom, 3D-printed parts? [A] Have Vex IQ parts (beams and pins) available for students to examine. [C] Have a teacher-prepared sample part (or former student projects) available for students to examine. [D] Note: A library of CAD files for Vex IQ parts can be found at: https://www.vexrobotics.com/vexiq/resources/cad-snapcad. [E] Note: General guidance on 3D printing with the Vex IQ system can also be found at: https://www.vexrobotics.com/vexiq/resources/cad-snapcad. This project requires basic 3D-modeling ability in a program such as Fusion 360, OnShape, or SOLIDWORKS. Alternatively, the lesson could be used to teach basic 3D modeling skills, but not all the details are provided here. This project is recommended as an individual project. [A] Vex IQ parts (beams) are attached to other parts using plastic pins provided as part of the Vex IQ robotics kit. The Vex parts have standard hole sizes and a standard spacing between holes. Because of this standardization of attachment holes, custom parts can be created that follow this hole pattern. These parts can then be attached to the existing Vex parts using standard Vex pins. Vex IQ parts follow the standard sizing guidelines shown in the drawing: 3D-PRINT-DIMENSIONS, Sheet 1, 2014-03-26. The drawing can be downloaded from: https://content.vexrobotics.com/vexiq/pdf/VEX-IQ-3D-Print-Dimensions_v20140326.PDF. [B] Students should create a 3D model that incorporates the standard pattern for Vex connecting pin holes. A recommended first model is a name badge, for example a 2x2 beam with student initials added. 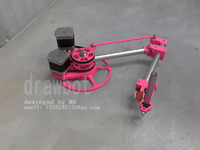 An example 3D model is shown in the attached pictures. Notes on Part Geometry: Holes are spaced on a 12.7 mm apart on a grid pattern and have a diameter of 4.2 mm. Part thickness can be adjusted as desired. If the entire Vex IQ part geometry is modeled, please note that the bottom of the print will either require hard to remove supports or need to be printed with some unsupported sections. A simplified geometry with a flat bottom surface may be preferred. [C] As an alternate approach, CAD files for Vex IQ parts can be downloaded from: https://www.vexrobotics.com/vexiq/resources/cad-snapcad. These files can be used for reference geometry or modified as desired to create a custom part. [A] Once the 3D model is completed a print file should be prepared and sent to the 3D printer according to whatever process is relevant for your 3D printing setup. [B] After the 3D print is complete, the holes for the connecting pins may have some irregularities. It is recommended that one of the metal Vex IQ shaft pieces be inserted and then spun to clear the hole. Once this is done connecting pins should be straightforward to insert. [C] Test the part to make sure it attaches to other Vex parts as desired and serves its function. The project could be extended to create more complex parts and the time would increase accordingly. 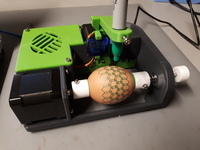 Students will demonstrate their knowledge by producing a 3D-printed part and demonstrating that it is functional in its intended use. Teachers can assess both the digital 3D model created and the physical 3D print produced. Supports - students in need of additional support can be provided additional guidance during the 3d modeling and printing process. Language - much of the work is based on 3D modeling, parts, and dimensions, as such the lesson is less reliant on language skills, though typical classroom supports may be helpful. For some software, it may be possible to provide the interface in the student’s native language. Extensions - There are many possible ways to expand the project; for example, custom parts can be used to create a new part for a robot end-effector or student could design a single piece robot chassis. Did you successfully create a 3D model of your intended design? Did your part 3D print as intended? If not, what problems occurred? What other parts could you create with this process? What are some parts would you not be able to create effectively with this process? Why? Say thanks by giving sgeiger a tip and help them continue to share amazing Things with the Thingiverse community. We're sure sgeiger would love a Tip, but unfortunately they have not setup their accounts to receive them yet.